Destiny's Hand by Nunzio DeFilippis and Christina Weir (Art by Melvin Calingo) is a wonderful manga. 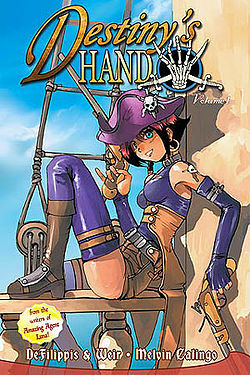 Destiny's hand is about a girl-pirate, named Olivia, and her crew. For this post I'm going to give you character bios, to help you understand the story better. Olivia: She's Captain Belaine's (see: Captain Belaine) favorite of the crew and the only girl pirate you'll ever meet. It all started when Olivia was 13 and she was on a ship going to Volroux to get married to a man she didn't like, and on that trip her ship gets attacked by the Destiny's Hand. When the pirates come on to her ship they tie every one else up and then Olivia takes one of the pirate's swords and tells them that they would fight for her fathers life. She ends up winning that fight then asking if she can join their crew, after that the captain says that she can join them. The book time-lapses to three years later after they tell you that back-story. Olivia is the ring-finger of Destiny's hand (you'll find the meaning of that when you read the book, as with all the others). The ring finger is the finger of future. Captain Belaine: He's the captain of Destiny's Hand, and currently part of a dying breed, gentlemen pirates. If anyone ever passes by his boat they know to strike their "colors" (meaning they surrender). Captain Belaine takes over the ship, takes your cargo, ties you to the main-mast, then returns you to the nearest port while telling you pirate stories along the way (it's much better than the alternative). At the beggining of the book he delivers the news that he's dying and he tells his crew to look for The Devil's Eye, a magical object that Captain Belaine wants to be found under his name. Badru: He's a foreigner from the outer islands who is extremely loyal to Captain and helps aid Olivia on a very important errand. Badru is the biggest person on the crew and used in many threats, so it seems. Badru is the pinkie finger of Destiny's hand, the finger of promise and loyalty. Diego: He's loyal to Captain Belaine, but when Olivia starts to give the orders Diego doesn't cooperate. Diego is more like the new "version" of pirates. Meaning that he's more prone to violence than anyone else on the crew is. Diego is the middle finger, the finger of aggression and discipline. Fredrick Matthau: The crew would be lost without him to guide them through the wide, open sea. Matthau seems to be the only person (besides Belaine) who knows Captain Belaine's history with the Governor of Vickensburg, and the lady (Lady Kate) that the boat's figure head is fashioned after. He is the thumb of Destiny's Hand, the finger that leads the rest. Elias Houghton: He is the Governor of Vickensburg's son, or so it seems. As the book goes on you find out some interesting things about his past, that may or may not include Captain Belaine. Elias is the index finger of Destiny's Hand, the finger that will point the way to the Devil's Eye. Wyatt: He's just a little boy who snuck onto the boat when they were at port. He's been living in the crow's nest ever since he snuck on, and he's just been helping the crew with all their jobs, because everyone knows that he who eats, works. Owen Galviston: He's a journalist who came onto the ship to write a biography about the Gentleman Pirates (Yes... that's all I have to say about him). Keep an eye out for the sequel, you're going to want it. Sorry, this post is kind of long!